The article investigates the intuition that both scientific realism and scientific antirealism are turning into degenerating research programs. The evolution of realism in reaction to pessimistic (meta)induction has certainly led to its increased sophistication as it has given rise to various versions of selective realism. However, many current discussions seem either too focused on semantic niceties or are turning into endless quarrels over case-study refutations of particular forms of realism. The point of finding a better understanding of the relations of scientific knowledge to the world seems to get lost in the process. Magnus, Callender, and Saatsi are among those who see the problem. Although drawing on different observations, they agree that the source of the problem is the wholesale approach according to which it is possible to resolve the realism debate in one move, by finding a single universal method of interpreting any scientific theory. Instead, they call for a more modest approach, based on case-by-case analyses. Particularly promising is Saatsi’s idea of exemplar realism, according to which realism should be an attitude motivating detailed case studies rather than a specific account of science in general. Boyd R. (1980), Realism and Naturalistic Epistemology [w:] PSA: Proceedings of the Biennial Meeting of the Philosophy of Science Association, vol. 2: Symposia and Invited Papers, Chicago: The University of Chicago Press, 613-662. Fine A. (1984), The Natural Ontological Attitude [w:] Scientific Realism, J. Leplin (ed. ), Berkeley: University of California Press, 83-107. Gross A. G. (1990), Reinventing Certainty. 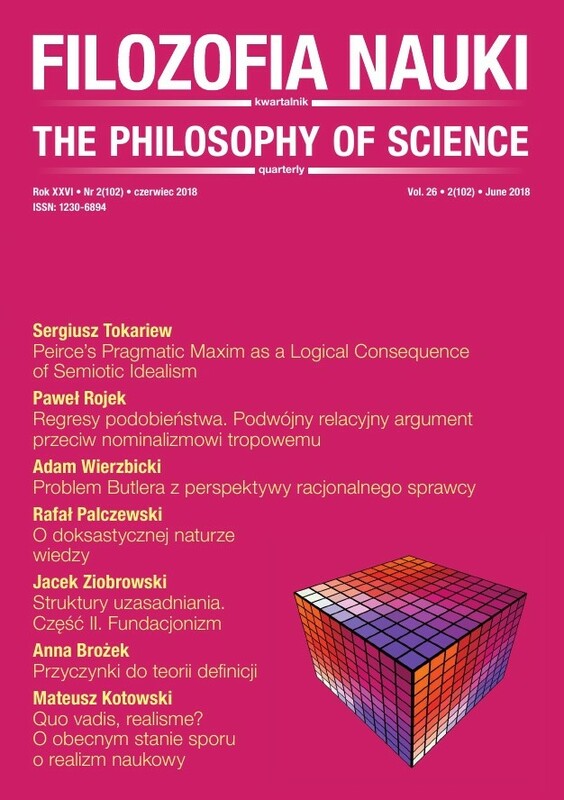 The Significance of Ian Hacking Realism [w:] PSA: Proceedings of the Biennial Meeting of the Philosophy of Science Association, vol. 1: Contributed Papers, Chicago: The University of Chicago Press, 421-431. Kitcher P. (1993), The Advancement of Science. Science without Legend, Objectivity without Illusions, Oxford: Oxford University Press. Kotowski M. (2014a), Do We Need One Scientific Realism?, "Lectiones & Acroases Philosophicae" VII, 1, 47-62. Kotowski M. (2014b), O rozwoju realizmu naukowego jako selektywnego sceptycyzmu, "Filozofia Nauki" 22(3) , 105-123. Kotowski M. (2016), Filozofia Iana Hackinga a spór o status poznawczy wiedzy naukowej, Wrocław: Oficyna Naukowa PFF. Lipton P. (2004), Inference to the Best Explanation, Second Edition, London: Routledge. Musgrave A. (1988), The Ultimate Argument for Scientific Realism [w:] Relativism and Realism in Science, R. Nola (ed. ), Dordrecht: Kluwer Academic Publishers, 229-252. Papineau D. (1996), Introduction [w:] The Philosophy of Science, D. Papineau (ed. ), Oxford: Oxford University Press, 1-20. Psillos S. (1999), Scientific Realism. How Science Tracks Truth, London: Routledge. Putnam H. (1975), What is Mathematical Truth? [w:] Philosophical Papers, vol. I: Mathematics, Matter and Method, Cambridge: Cambridge University Press 1975, 60-78 (tłum. polskie: Czym jest prawda matematyczna?, tłum. R. Murawski [w:] Współczesna filozofia matematyki. Wybór tekstów, R. Murawski (red. ), Warszawa 2002, Wydawnictwo Naukowe PWN, 244-265). Saatsi J. (2012), Scientific Realism and Historical Evidence. Shortcomings of the Current State of Debate [w:] EPSA Philosophy of Science: Amsterdam 2009. The European Philosophy of Science Association Proceedings, vol. 1, H. de Regt, S. Hartmann, S. Okasha (eds. ), Dordrecht: Springer, 329-340. Worrall J. (1985), Scientific Discovery and Theory-Confirmation [w:] Change and Progress in Modern Science, J. C. Pitt (ed. ), Dordrecht: D. Reidel Publishing Company, 301-331. Worrall J. (1989), Structural Realism. The Best of Both Worlds?, "Dialectica" 43(1-2), 99-124.